Co. Clare: Feakle (4), Killaloe (3), Killuran (2), Kilnoe (2), Orgunnella (2), Scariff (4). Co. Galway: Clonrush 92), Woodford (2). Co. Clare and Co. Galway: Mountshannon. The Board also included 8 ex-officio Guardians, making a total of 34. The Guardians met on alternate Thursdays. The population falling within the Union at the 1831 census had been 47,894 with divisions ranging in size from Mountshannon (population 2,198) to Feakle (8,744). The new Scariff Union workhouse was erected on a six-acre site half a mile to the south of Scariff. Designed by the Poor Law Commissioners' architect George Wilkinson, the building was based on one of his standard plans to accommodate 600 inmates. Its construction cost £6,400 plus £1,050 for fittings etc. The workhouse was declared fit for the reception of paupers on 1st October 1841, and received its first admissions on 11th May 1842. The site location and layout of the Scariff workhouse are shown on the 1898 map below. 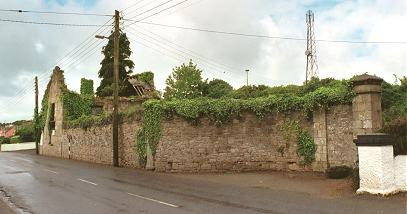 The boundary wall at the south of the site had a central entrance, and a small single-storey block at each side. An entrance and administrative block contained a porter's room and waiting room at the centre with the Guardians' board room on the first floor above. ...so overcrowded with paupers that a disease almost amounting to a plague has broken out amongst the inmates - the deaths averaging from four to 12 daily. It is horrifying to behold a donkey and cart laden with five and six bodies piled over each other, going to be interred, and not a person attending the wretched cortege except the driver. The graves are so dug that the coffins are barely covered with earth, rendering the air infected. No coroner's inquests have been held. Later that month, the union had virtually run out of money and for a while had to close the workhouse. Workhouse staff also suffered from the famine — in November 1847, the workhouse matron, Mrs William O'Brien, died from fever caught in the discharge of her duties. As in a number of other distressed unions, the Poor Law Commissioners dissolved the Board of Guardians and appointed their own 'vice-guardians' to manage the union. In 1849, many such unions belatedly received some financial assistance via the British Government's rate-in-aid scheme. A measure of the scale of the pressure on the union is the fact that in 1851, Scariff was providing workhouse accommodation to 4,121 inmates spread across 17 different buildings. Following the famine, the size of some unions, particularly in the west or Ireland, was reduced and more than thirty new unions were created. In 1852, the western part of the Scariff Union went to become part of the new Tulla Union. The workhouse was burnt down in June 1921 — said to have been carried out by the IRA to prevent the building being used as a barracks by the 'Black and Tans' — a British reservist force. 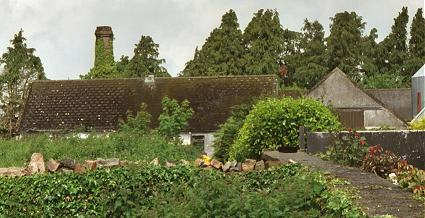 A few of the workhouse outbuildings survive. Part of the site is now occupied by an agricultural supplies company.